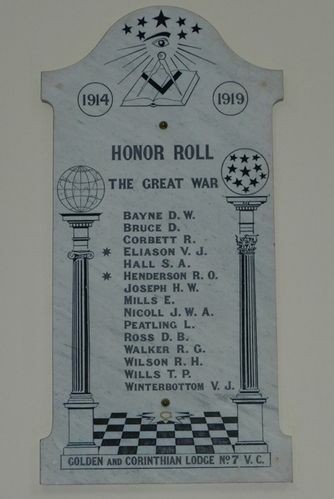 An honour roll commemorates the members of the Golden and Corinthian Lodge who served in World War One. The No. 7 at the bottom of the roll indicates it was the 7th Lodge established in Victoria under the Victorian Constitution (VC) in 1854. Golden and Corinthian Lodge No 7 V.C.